Plus Windows Phone UI tweaks? Microsoft may soon put the "bigger is better" adage to the test if a rumored OS update helps produce 5- and 6-inch Windows Phone 8 devices. ZDNet cited unnamed sources in a report Thursday who claimed that Microsoft's third "General Distribution Release" (GDR3) update will add support for larger WP8 devices when it's released sometime before early 2014. The site's contacts also confirmed Tuesday's rumor that GDR3 will add support for 1080p resolution displays on handsets running the mobile operating system. Given all the rumors lately it seems Microsoft's mobile offerings is about to get bigger and sharper, which could help give it a welcome boost and a new niche to fill in the market place. In the very near future everyone will look to Samsung's Galaxy S4, a 5-inch 1080p handset that will likely set the standard for 2013 and beyond, at least in terms of screen quality. Microsoft will find it hard to compete if it can't meet those standards, and even an update bringing it up to speed by the end of the year (when GDR3 is currently expected) will be pushing it when the Galaxy S4 would have been out for months by then. HTC's Tiara is rumored to be the first device that will launch with the GDR2 update to Windows Phone 8, and it's believed the 4.3-inch phone could arrive as early as May. If the Windows Blue update for Windows Phone arrives in early 2014 like various reports have indicated, then it makes sense for GDR2 to land during the summer and GDR3 to arrive in time for the holidays. It's currently unknown what changes GDR2 will bring, but ZDNet's sources hinted that GDR3 could add some UI tweaks and changes to core apps, including adding a third column to the start screen, in addition to allowing for bigger and higher-res handsets. The report of course comes on the cusp of another that Microsoft is tinkering with a 7-inch Surface tablet, so perhaps we'll see the company make a move to these in-between devices within the next 12 months. 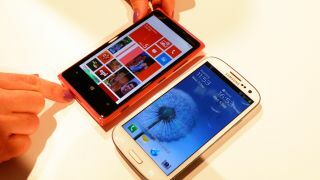 Excited by the prospect of a 5- to 6-inch Windows Phone 8 handset? Let us know in the comments where you stand on phone size.